I just purchased a new car. Do I need to get car insurance right away? Yes, it is very important that you have car insurance to insure your new car. No matter how safe of a driver you are, you will never be able to overcome the negligence of other drivers. 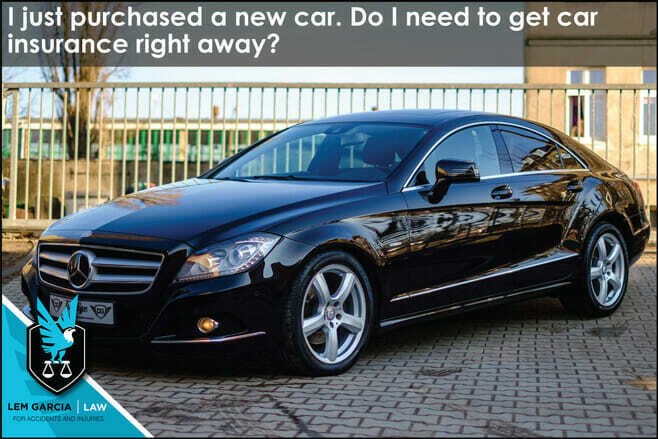 If you don’t insure your new car, you can be in for a world of hurt in the event you are involved in car accident. For starters, if you don’t have car insurance when you are involved in a car accident, the DMV can suspend your license for one year. The DMV can suspend your license whether or not you were at fault for the crash. The DMV is merely concerned that you were driving without car insurance. It gets worse. If you don’t have car insurance, and you were injured in the crash, you will not be able to recover anything for your pain and suffering – no matter how injured you were. Generally, the other party owes you for your medical bills, pain and suffering, and lost wages. But if you don’t have insurance, you only have a claim for your medical bills and lost wages. Your claim for pain and suffering is lost if you do not have automobile insurance at the time of the crash. This dramatically hurts the value of your case and you may find it difficult to find an attorney to take your case. Lastly, if you don’t have car insurance of your own, and the other party does not have enough insurance coverage to pay you for your property damage, you may end up owing your finance company a lot of money. For example, if you purchase your vehicle for $30,000 and the value of the car is now only $25,000, the car insurance company will only owe you the value of your car, which is $25,000. Unfortunately, if the other party does not have liability property damage for $25,000, they will not be able to pay you that much. The insurance company is only liable up to their insured’s policy limits. If the other party only has $10,000 in property damage liability coverage, they will only pay you $10,000 and apply it to your balance. If you had a balance of $25,000, you will still owe $15,000 and be without a car. If you had collision coverage, you could use your own coverage to pay for the full value of the car and if you have gap insurance, they will pay the difference between the value of the car and your balance. In short, it is a great idea to have car insurance for your new car before you leave the lot. It can save you a lot of heartache if in the event you are crashed into by someone who does not have coverage or by someone who does not have enough coverage to pay you for your loss. West Covina car accident attorney, Lem Garcia, helps people get compensated after a car accident even if you were not insured at the time of the crash.